Midtownies! Raph here, with some reviews for you. The Image series Rat Queens recently released its first volume, and Marvel is continuing it’s All New Marvel Now with Ghost Rider and Iron Patriot. My thoughts on those series follow after the break. Rat Queens is a series published by Image Comics, and it is an entertaining fantasy romp. The eponymous Rat Queens are a rowdy group of guns for hire who find themselves at odds with other mercs, the authorities at Palisade (the town where the story takes place) and just about everyone they encounter. When the mayor of Palisade gets tired of the drinking and the brawls, she orders hits put out on the Rat Queens and their rivals. The ensuing brawls are full of magic, fists and a couple of low blows. The Rat Queens fight to protect each other and the things the care about, and we learn about each member: the Elven Mage Hannah, Violet the Dwarf Warrior, Dee the Cleric and Betty, a Smidgen (think Pixie meets Dwarf) Thief. Even though the majority of the story takes place in and around Palisade, the greater world seems very fleshed out and established. There’s not a lot of plodding exposition; if anything, the dialogue flows really well, and the characters are distinct in their character and personality. I’m a big fan of Kurtis J. Wiebe. I’ve only read one of his other works, but that book was Peter Panzerfaust. Peter Panzerfaust is the tale of Peter Pan re-told with World War II France as the backdrop. Both books are books I read consistently, and Mr. Wiebe’s a writer that has earned a look from me every time he puts something new out. Roc Upchurch’s art is gorgeous, he definitely put some thought into each character’s design, and his art is evocative of another artist at Image, Fiona Staples. Saga and Rat Queens both have a similar feel artistically, and that’s about as high a compliment as I can think of. James Rhodes gets a chance in the spotlight as he takes on the role he’s been given in Iron Man 3: the Iron Patriot. In this opening issue, we get a look at Rhodey’s family life: we meet his father and his niece (whose mom, Rhodey’s sister, passed away). The idea of family is juxtaposed against responsibility, as Rhodey decides to drastically change the mission statement of the Iron Patriot. 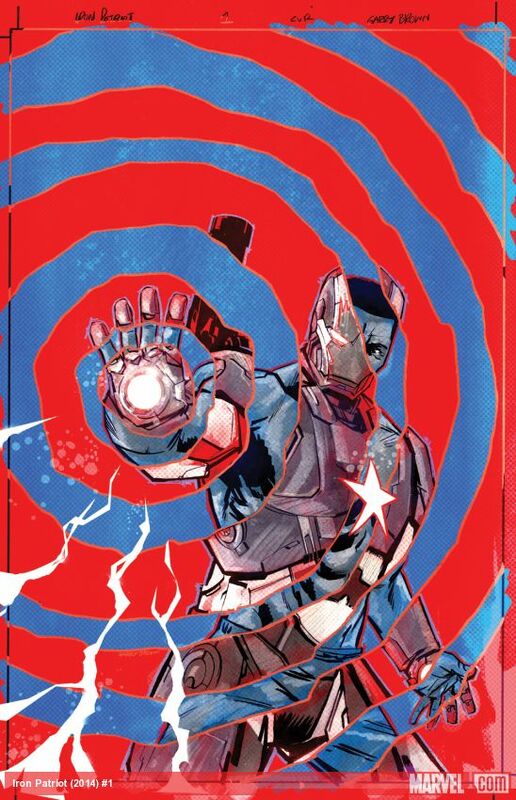 Iron Patriot will only engage in domestic affairs, in international cases, he’ll only be involved in rescue situations. 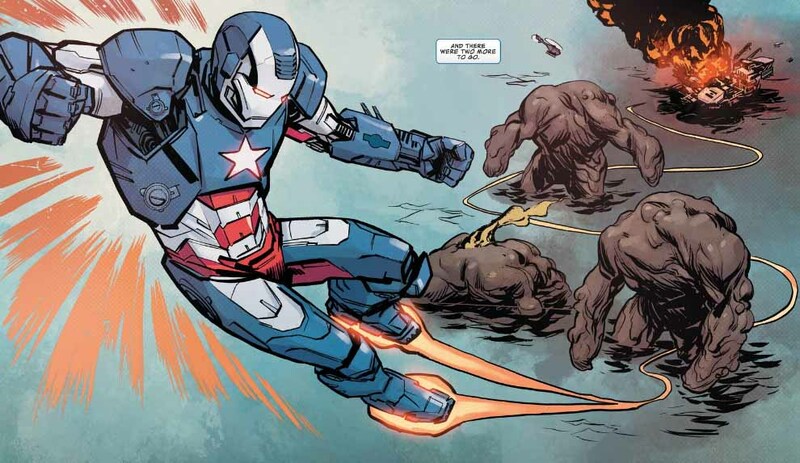 The blowback is major, especially in the political arena, as a mysterious enemy is trying to take down Iron Patriot, and that means hitting him where it hurts: at home. It looks like Rhodey is in for the fight of his life in this series, and it’s interesting how the politicians in Washington might affect a bonafide superhero, particularly since he’s an active member of the US Military. Ales Kot is the latest and greatest that Marvel has poached from Image. It seems like any standout creators who put out work through Image end up working for the House of Ideas. That’s by no means a negative, and if anything, shows that Image knows how to separate the wheat from the chaff. Kot’s work on Secret Avengers is terrific, and along with the Image series Zero, shows the Kot knows his espionage/thrillers. A wildly different take on the Spirit of Vengeance, Felipe Smith has decided to swap out the motorcycle and bring the world of street racing to the Spirit of Vengeance. Young Robbie Reyes works as a mechanic in a rough neighborhood, trying to make a living for himself and his disabled, comic-loving younger brother. Robbie’s desperation to give his brother a better life leads him to street racing, with disastrous results. The opening issue is really just to establish the new Ghost Rider, and we’re going to get more of the motivations and explanations of how Robbie becomes Ghost Rider later on. Felipe Smith and Marvel are definitely trying to push the Fast and Furious vibe with this book, it’s evident throughout the social media and promotions that they put out, and it’s not a bad entry into the genre, the problem is that with this first issue, if this were a movie, we’re only about 10 – 15 minutes in. I like what I saw, but we got very little street racing, and I feel like I need more. That’s as much a compliment to the writing of Felipe Smith as it is a criticism. I need to know more, but I don’t mind being strung along. I have to be honest, seeing Tradd Moore on a Marvel book is jarring. Tradd’s work on the Luthor Strode series with Justin Jordan is bloody and visceral, and very specifically stylized. His Ghost Rider looks radically different than anything I’ve seen in a mainstream book, and I have to applaud Marvel for bringing in such a diverse group of talent. Different makes things interesting, it makes people talk about the books in question. I know people at the store have had very different reactions to Tradd’s artwork, but the end result is they pick up the book and want to find out more. That’s always a good thing to see. I’m definitely on board to see what happens with Felipe, what demon is possessing him, and will he be able to control it.